I've been working hard to cook more veggies lately. Don't get me wrong, I LOVE eating vegetables. But when you have a husband with a hollow leg most easily filled with meat and carbs and a toddler who is still figuring out textures (especially when it comes to vegetables) it can be much easier to just steer clear. (We make up for it by enjoying plenty of Kale & Pineapple Smoothies.) If it were up to me, I'd eat vegetables like squash, sauteed greens and sweet potatoes every day this time of year. Obviously it would all be topped with a perfectly poached egg. Now that delicious squash are in season, I'm working hard to incorporate them into more meals in the hopes of expanding Riley's toddler menu selections. He already loves butternut squash, cubed and roasted with a little olive oil, salt and pepper. I've been taking that knowledge and using it to introduce him to other types of squash like acorn and delicata. This roasted delicata squash with pecans, sage and (warm) miso dressing is one of my new favorite ways to enjoy all the flavors of fall. The squash is delicate and nutty on its own but becomes even more lovely with the addition of buttery pecans, crispy sage, and the sweet-salty flavor of shiro (white) miso dressing. This is a great dish to make for Meatless Mondays. With a simple salad or topped with a fried or poached egg, you can easily make this in under 30 minutes. 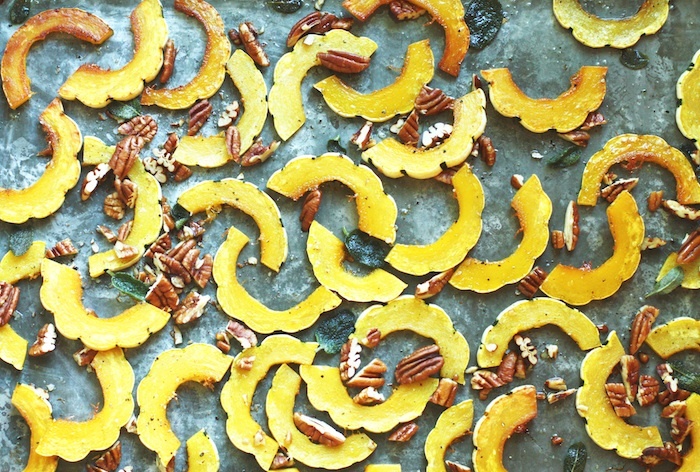 What are you favorite dishes to make with squash this time of year? I need to expand my horizons so I can take full advantage of all the squash varieties out there! 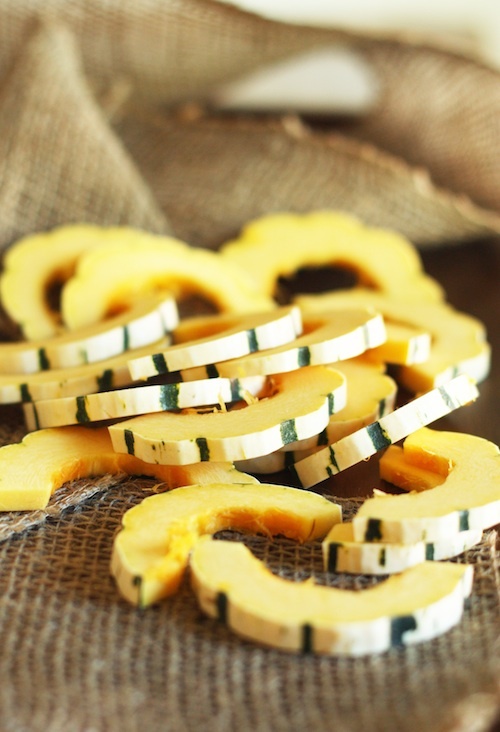 Spread the delicata squash slices on a large, rimmed baking sheet. Drizzle the squash with the walnut oil and toss to combine. Place the baking sheet in the oven and roast the squash for 10 minutes. After 10 minutes, add the pecans and sage leaves to the pan and roast for another 5 minutes until the pecans are barely toasted and the sage leaves are crisp. Watch carefully so nothing burns! Meanwhile, heat the sesame oil in a small saucepan over medium-low heat. Add the garlic clove and gently cook for about 1 minute until the garlic is fragrant and has infused the oil. Add the miso paste, rice vinegar and water. Stir until the miso paste is smooth and the dressing is warm. Season with salt to taste. Keep warm until ready to use. Transfer the squash, pecans and sage leaves to a serving plate (or divide among 4-6 plates) and drizzle with the warm miso dressing.